The picture is from Christmas 1977. 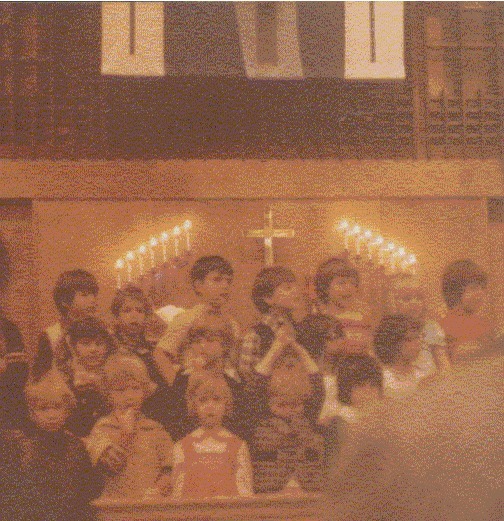 I’m in the back row, second from the left under the candles. It’s a program of a Lutheran congregation in Billings MT, a predecessor to the Evangelical Lutheran Church of America, or ELCA. While I lived in a range of families since I was in foster care, my primary church experience growing up was mainline; first Lutheran and then Presbyterian Church USA. I mention this because to be mainline, in particular to be a liberal Protestant, is often taken as a half way house to atheism. Dan Fincke, an atheist philosopher argues that we’re “half way liberated” while one evangelical site calls us “closet atheists”. One gets the idea that we were once evangelical or orthodox or conservative but having been acquainted with the sciences, religious pluralism and the all too human nature of our sacred texts we are those folks who are engaged in an “endless desperate contortions to justify their religious traditions” so as to remain Christian. Now clearly on the individual level, as someone who grew up in this tradition, I didn’t adopt it to remain Christian. It’s the only form of Christianity that I’ve ever participated in. I simply never grew up with hell and the fear of other religions. And never heard of creationism until I was in high school. Most of the trappings of evangelical protestantism I was oblivious to until I went to college and ran into para church ministries there. And I never ran into reactionary Catholicism until after college. So liberal Protestantism, was the only thing I knew. Everyone was mainline, Lutheran, Methodist, Presbyterian and religious diversity meant Catholics. Now, the para church groups and the rise of the religious right, as expressed in the late 80s and early 90s did shake my faith. It did make me question what I believed and didn’t believe, while in college. It certainly fed into my interest in reading up on religion. Because if there was a fault in my growing up years, it was that I was exposed to so few religious doctrines that despite spending a childhood in the church, I felt like I was ill prepared to sort out these questions. Non creedalism, as a child, means not having to overcome bad religious ideas but also floating on a sea of unknowns. How that is done is often expressed in negative terms, partly by opponents of liberal Protestantism but also by it’s friends. It ends up being a list of things one does not believe. This has the advantage of clearing necessary ground. It’s difficult to speak of what one believes without also knowledge also of what one does not believe. But I think too often it stops there and we never get to the positive beliefs. That was my experience of John Shelby Spong, who was so formative for me, in giving me freedom to question things but who never gave me constructive resources to build anew. Given that the origins of liberal Protestantism is the Reformed heritage that finds it’s origins in John Calvin, I’d want to situate the positive content of liberal Protestantism in God. On the one hand, every theology, given it’s name should start with God. But in fact, I find that theologies start from a number of places, from the Bible, from Jesus, from the Church (with a capital C). My bias is to believe that one’s normative beliefs about God ought to provide the structure by which other religious claims are accepted or rejected or fit in together. In such a view, the point of Christianity is not Jesus but the God that is revealed in Jesus, not the Bible but the God which calls us in scripture, not the Church but rather the way God can be connected to in the ecclessia. A beginning premise comes from Langdon Gilkey, who writes in Naming the Whirlwind that “liberal theology has been based on the ability of reason to discern and establish an order of ultimate coherence and value in process, which might be called God…” This allows there to be a relationship between God, humans, and the world which provides a means of evaluating religious accounts. So when we speak of God as good it is to speak of what we understand to be the good and in this case the source of good. That should be discernible with and have continuity with what we find in nature and human experience. The same goes with God as the power that makes for salvation. God as the creator and ground of individuality. And so on. This is why all knowledge, whether from the sciences to philosophy, from sociology to the insights of various religious traditions are relevant and provide the basis of for theological reflection. Because there is no area in life and in inquiry, that doesn’t bear on these basic questions of what kind of world we live in, how we ought to live, and towards what ends we should seek. And those questions provide the context to get a handle on God, which is the grounding to these questions, of human existence. How does that relate to the question of Christian faith though? Ogden argues that we’re seeking to mediate the questions of human existence to the witness of the Christian faith. For me, it has provided a place to raise these questions in the first place and a language to speak about them. And a context, in my case in campus ministry, by which they can be raised and discussed. But it has also provided a treasure trove of practices and ideas that can be explored in community to respond and to engage these questions. To be a Christian is to join that conversation which has unfolded over the millenia. To be faithful is to seek the best as it relates to God and human life. So yes, one can be faithful and criticize a religious tradition even to set aside traditional beliefs. One does so because it is to God and not to this or that facet of the tradition to which we are ultimately responsible to. It is to the good, to that which saves and transforms us (which are themselves Christian categories of naming reality) which we want to relate to. The tradition provides a means of doing that, but when it fails, it too must be revised and transformed as well. In that I’m not a secret agent, coming into the church to push liberal ideas. I’m a home grown liberal Christian, who is seeking to be faithful to what I understand to be God’s call on us, which while bigger then anyone tradition, needs people rooted in history, in traditions, in communities (i.e to one another) to respond efficaciously to that call. The one I choose is the one that chose me from childhood onwards. And if I seek to change and modify things, it’s only in relation to a tradition which gave me the tools and the resources to do that. One’s call differs from person to person. But a life of integrity requires one to be faithful to it, wherever it leads.